Thai Green Curry Chicken is a very classic Thai dish. The flavor of the coconut milk combined with the Thai Green Curry Paste, made from our Thai Coconut Green Curry Powder, provides a rich flavor without having to scour local markets to find all the ingredients to make the paste. The shallots, lemongrass, green chile peppers and other spices have just the right flavor balance you expect in a green curry dish at your favorite Thai restaurant. 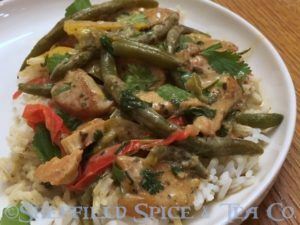 This Thai Green Curry Chicken recipe uses green beans and bell peppers along with the chicken. The result is very tasty without being too spicy as some curry pastes can make the dish. Of course if you want to add a finely chopped serrano chile pepper to the simmer for extra spiciness, go ahead. This dish can be served alone, with a side dish of your choice, but we like to serve it over Jasmine rice. The flavor compliments the curry chicken. Cooked Jasmine Rice, for serving. Prepare while the chicken is cooking. In a small mixing bowl make the Thai Green Curry paste by combining the Thai Coconut Green Curry Powder with the 3 Tablespoons of water. Mix well and set aside until needed. Slice the chicken across the grain into ½ inch strips. Sprinkle the salt on the strips. In a large skillet, add the olive oil and heat over medium-high to high heat until the oil starts to shimmer. Carefully add the chicken strips. Cook the chicken 2 to 3 minutes on both sides until golden brown. You are browning the strips, not fully cooking them through, so don’t overcook. Transfer to a plate. Reduce the heat to medium-high. Add the Curry Paste and stir for a minute to release the flavors. Add half of the coconut milk and scrape off an brown bits. Stir a bit to combine the paste and coconut milk. Add the rest of the coconut milk. Bring to a boil over medium-high heat. Add the chicken, green beans and sliced peppers to the skillet. Reduce the heat and simmer for about 20 minutes. Add the chopped cilantro, stir in and simmer for another minute. When ready, serve over the Jasmine rice. Garnish with a lime wedge and fresh cilantro leaves.